David McAlpin, a principal at Fradkin & McAlpin Architects, is among a group of 21 noted architects and landscape architects, including Steven Holl, Laurie D. Olin, Peter Pennoyer and Diana Balmori, who have been invited to solve a mystery that is more than 130 years old. 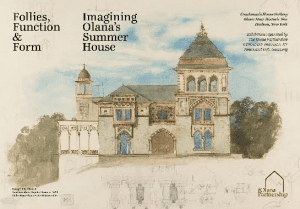 The Thomas Cole National Historic Site and The Olana Partnership/Olana State Historic Site will co-host an exhibition of contemporary art to highlight the pivotal role that the two historic properties – and the artists who lived and worked there – played in shaping America’s culture of contemporary art. Craig Thompson, director of Five Rivers Environmental Education Center, will host an outdoor foray to search for bluebirds, robin redbreast, white trillium and other colorful signs of spring on Sunday, April 1. 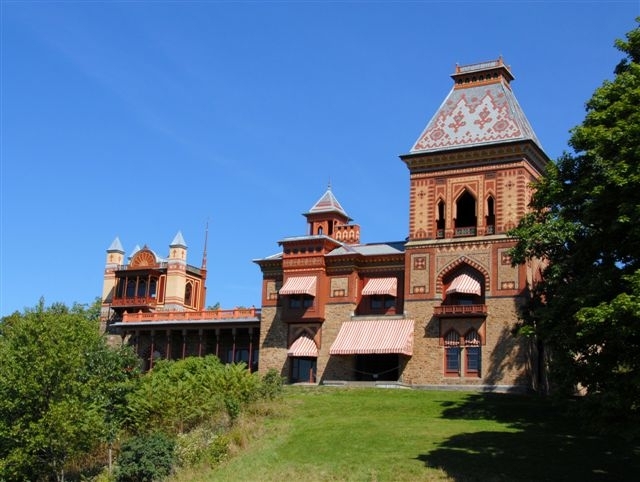 An Olana educator will join the group to discuss the history of the landscape and carriage drives designed by Frederic Church. Craig Thompson has been an environmental educator in NYS DEC’s Division of Public Affairs for over 30 years. Five Rivers, one of the state’s environmental education facilities, is a 445-acre “living museum” offering a comprehensive program of interpretive, education and information services year ‘round. The Spring Walk will take place from 2:00 pm to 4:00 pm, and is free and open to all ages. Meet at the Wagon House Education Center and dress for casual trail walking. Binoculars are helpful but not necessary. Space is limited, so please register by calling (518) 828-1872 ext. 109. In the event of inclement weather, the program may be canceled. (If in doubt, call (518) 828-1872 x 109 to confirm.) A vehicle use fee will be charged at the entrance to the site. In 1979, a nuclear power plant was nearly built on the Hudson River in plain view of Olana State Historic Site. The Olana Partnership is presenting a panel discussion on Saturday, February 25, about this little-known incident in Hudson Valley history. For the first time ever, three key players in this debate will unite and recount this game-changing episode, and how each played an important role. The panelists, Carl Petrich, J. Winthrop Aldrich, and Richard Benas, will discuss the unprecedented and nationally significant approach of considering the visual impact of a nuclear power plant in a region. Dorothy Heyl, a member of Olana’s Landscape/Viewshed Committee, will moderate. In 1977, the Nuclear Regulatory Commission and the Power Authority of the State of New York held hearings on siting a nuclear power plant just south of Catskill in Cementon. The cooling tower, at a height of 450 feet, would have been visible for many miles. Thirty-five stories tall, it would have been 250 feet in diameter at its highest point and discharged a prominent plume. On some days, the plume would have obscured views of the Catskill Mountains from many locations, including Olana. In the late 1970s, Carl Petrich, one of the panelists, worked as a landscape architect on the research staff of the U.S. Department of Energy’s Oak Ridge National Laboratory in Tennessee. Through an agreement with the Nuclear Regulatory Commission, Oak Ridge produced an Environmental Impact Statement for this project. Petrich immersed himself in Hudson River School history and the designed landscape of Frederic Church’s Olana. His conclusion—that the viewshed from Olana was of national importance and warranted protection—changed history. The resulting Environmental Impact Statement caused the Nuclear Regulatory Commission staff to recommended denial of a construction license for the proposed nuclear power plant. This was the first and only time that such a recommendation had been made on any grounds—let alone environmental or aesthetic. J. Winthrop Aldrich, a Hudson Valley resident and long-time public servant, worked with counsel for local groups opposing the siting of the plant in Cementon. 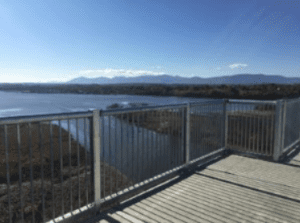 He was a proponent of assuring that the impact of the project on historic and scenic resources would be formally weighed in the decision making. Richard Benas, then at the New York State Department of Environmental Conservation, testified in hearings on the proposed plant. Based on this experience, Benas later developed visual impact guidelines which are now used to insure compliance with the New York State Environmental Quality Review Act, SEQRA. The panel discussion will begin at 3:00 PM on Saturday, February 25 in Hudson, NY, at Stair Galleries (549 Warren Street). A suggested donation of $10 can be paid at the door, and admission is free for all members of The Olana Partnership. A reception will follow. More information is available online at olana.org or by phoning The Olana Partnership at 518.828.1872. RSVPs appreciated. 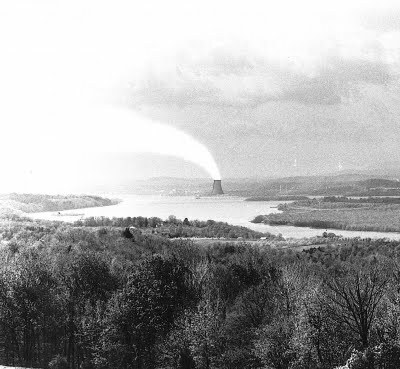 Photo: View from Olana with Superimposed Simulated Nuclear Cooling Towers (detail), 1979, photograph #4363-77, Courtesy of Oak Ridge National Laboratory, US Dept. of Energy. Richard Sharp, Chairman of The Olana Partnership, has announced the election of Joseph A. Pierson to the board of trustees. Pierson is president of Cypress Films, Inc., a successful, independent, New York-based film, theater and television production company. Most recently, he produced and directed EvenHand, an independent feature film shot on location in San Antonio, Texas. Currently in pre-production is a filmed adaptation of Patricia Highsmith’s A Suspension of Mercy and an adaptation of H.G. Wells’ The Invisible Man for the Broadway stage. 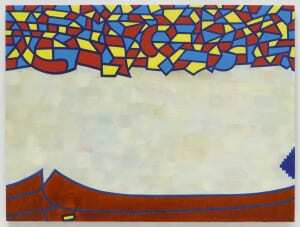 Pierson majored in Studio Art at Middlebury College, graduating with departmental honors. He has an avid interest in historic preservation, serving as a member of the Director’s Council of the Historic House Trust of New York City, the Trustees’ Council of the Preservation League of New York State, and as chair of the Fort Tryon Park Trust. In addition, Mr. Pierson serves on the board of the Greenrock Corporation and as president of Abeyton Lodge, Inc. In 1994, Pierson was elected a trustee of the Rockefeller Brothers Fund. He is a member of the Fund’s Pocantico Center and nominating committees. He and his family have a local residence in Columbia County, New York. On Sunday, October 30, 2011, Olana State Historic Site ended its 43rd visitor season, and changed over to its winter schedule (Friday through Sunday). Over 132,000 guests visited Olana in the past year, one beset with an abundance of rain, gasoline prices that threatened to hit $5 during peak travel season, two hurricanes and an October nor’easter. In December of this year Olana will mark another milestone as Linda E. McLean closes her last year as director at Olana State Historic Site, ending an almost 40-year museum career with New York State. McLean completed a master’s thesis on the photograph collection at Olana, working with then director Richard Slavin, and her abiding interest in Olana and American art developed from that point on. She joined the staff at Olana as Director of Education, stepping up to acting director when Slavin left to accept a post in Cooperstown. In 1980 McLean was offered and accepted a position of Director in her own right at the John Jay Homestead State Historic Site in Westchester County, and remained there until 2000, when she returned as Director at Olana State Historic Site, filling the position vacated by the late James Ryan. Photo: Main house at Olana. Courtesy Linda McLean. The weekend of September 24 and 25 offers two unique opportunities to enjoy the landscape at Olana State Historic Site. On Saturday, September 24, author and geologist Bob Titus will lead a Hudson Valley Ramble Walk at Olana starting at 2 p.m. On Sunday, September 25, Lin Fagan will lead a walk starting at 9 a.m. Both groups will meet at the Olana Visitor Center at the top of the hill and continue their respective walks from that location. The tour on Saturday has a $5 vehicle fee per car as the cost of admission; the tour on Sunday is free of charge. 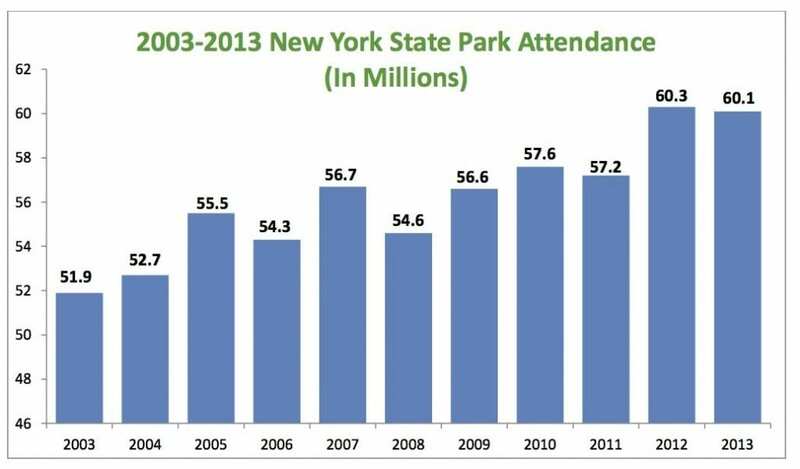 Professor Robert Titus has held several very popular Hudson Valley Ramble Walks at Olana. This year his walk entitled “Unplanned Views” will circle Olana looking at the dramatic views that artist Frederic Church took advantage of as he laid out his landscape. Titus will point out the views and then describe their geologic histories with a series of dramatic readings describing moments of time in the geological past that brought these views into being for Mr. Church. Reservations are required for this walk and it is limited to 20 persons; plan for two hours in the landscape with easy to moderate walking. Please wear clothing and shoes suitable for walking outside on shale paths and woodland areas. On Sunday, Lin Fagan will conduct a tour with a focus on the landscape and the wildlife, particularly the bird populations. Fagan, an Olana volunteer for over 20 years, is a long-time member of the Audubon Society, an avid hiker and birder who has travelled all over the United States. She will bring to bear her particular expertise in looking at the landscape and enjoying all that surrounds you. When not travelling or volunteering at Olana, Lin can most often be found hiking and birding in the Shawangunks in Ulster County. Her tour will include the landscape, the gardens, and Ridge Road. A loop around the lake can be added to the walk for those who are interested. Wear clothing and shoes appropriate for walking outside. For both walks, bring cameras, binoculars, sketch pads, water, and a pure joy for the landscape of the Hudson Valley. Reservations are required for both tours; please call 518-828-0135 between 9 AM and 5 PM Tuesday – Sunday to reserve a spot on one or both of these walks in the landscape. The Olana Partnership will host a two-day landscape photography workshop, Growing your skills beyond the snapshot phase, on Saturday, September 17 and Sunday, September 18 from 1-7:30 pm at the Wagon House Education Center at Olana. Photographer Greg Miller will teach participants how to blossom from a snapshot shooter to a photographer who makes compelling photos that elicit strong emotional reactions. Participants will learn about proper lighting, technical vs. artistic skills, composition, equipment, and technique, and will have an opportunity to shoot intimate scenes and vistas in Olana’s picturesque landscape. Cost of the workshop is $75 for Saturday only or $125 for both days for non-members, and $50 for Saturday only and $100 for both days for members of The Olana Partnership. An additional $5.00 entry fee per vehicle will be charged (waived for members of The Olana Partnership). This fee may be credited toward a house tour as long as tickets are available. Register now while space is available. Contact Sarah Hasbrook, education coordinator for The Olana Partnership, at shasbrook@olana.org or call (518) 828-1872 x 109. Wagon House Education Center programming is made possible in part through support provided by public funds from the New York State Council on the Arts, a State agency; the Hudson River Bank & Trust Foundation; the Educational Foundation of America; the John Wilmerding Education Initiative, and the members of The Olana Partnership. Photo: Hudson Valley by Greg Miller.